Novel therapies to target lung inflammation are predicted to improve the lives of people with cystic fibrosis (CF) but specific antiinflammatory targets have not been identified. The goal of this study was to establish whether TLR5 signaling is the key molecular pathway mediating lung inflammation in CF, and to determine whether strategies to inhibit TLR5 can reduce the damaging inflammatory response. The innate immune responses were analyzed in both airway epithelial cells and primary PBMCs from CF patients and matched controls. Additionally, 151 clinical isolates of Pseudomonas aeruginosa from CF patients were assessed for motility and capacity to activate TLR5. Blood and airway cells from CF patients produced significantly more proinflammatory cytokine than did control cells following exposure to the CF pathogens P. aeruginosa and Burkholderia cepacia complex (p < 0.001). Stimulation with pure TLR ligands demonstrated that TLR signaling appears to mediate the excessive cytokine production occurring in CF. Using complementary approaches involving both neutralizing Ab targeting TLR5 and flagellin-deficient bacteria, we established that inhibition of TLR5 abolished the damaging inflammatory response generated by CF airway cells following exposure to P. aeruginosa (p < 0.01). The potential therapeutic value of TLR5 inhibition was further supported by our demonstration that 75% of clinical isolates of P. aeruginosa retained TLR5 activating capacity during chronic CF lung infection. These studies identify the innate immune receptor TLR5 as a novel antiinflammatory target for reducing damaging lung inflammation in CF. Cystic fibrosis (CF)3 is an autosomal recessive disorder resulting from a mutation in the cystic fibrosis transmembrane conductance regulator (CFTR) gene. CF affects ∼1 in 3500 live births in North America. Although understanding and treatment of the disease have developed significantly during the past two decades, new treatment options for patients with CF are critically needed because the median age for survival is still in the mid-30s (1). Lung disease, the major cause of death in CF, is caused by a self-sustaining cycle of airway obstruction, infection, and inflammation (2). CF lung disease is characterized by neutrophilic airway inflammation, increased expression of proinflammatory cytokines, and infection by a narrow repertoire of bacterial pathogens, with Pseudomonas aeruginosa and Burkholderia cepacia complex being the most clinically significant pathogens. Current therapy for CF lung disease relies on antibiotics to treat bacterial infection combined with airway clearance strategies to mobilize viscid secretions (1). Antiinflammatory therapy has been shown to be beneficial for patients with CF, especially for younger patients with mild disease. Clinical trials using nonspecific global immunosuppressants (corticosteroids and ibuprofen) established that targeting excess inflammation is helpful in improving the lung disease of CF patients (3, 4). Unfortunately, safety concerns render these currently available antiinflammatory medications unacceptable for routine use. Although it remains unclear whether the CFTR mutation itself causes a proinflammatory milieu in the CF airways, or whether inflammation is always secondary to infection, this controversy is less relevant for the treatment of CF patients (5). Airway infection and inflammation are virtually universal in CF patients (regardless of the order in which they develop), and reducing inflammation is likely to augment current treatments and improve the clinical outcome in CF. To date, studies focused exclusively on identifying the mechanism responsible for inflammation in CF have yielded conflicting results (as recently reviewed in Ref. (6)); therefore, rather than specifically investigating the mechanism of inflammation, in this study we have taken the pragmatic experimental approach of identifying an immunological pathway that can be blocked to reduce CF airway inflammation. Targeting the signaling cascade responsible for overproduction of inflammatory cytokines is a particularly attractive treatment approach for reducing inflammation in the CF lung. There is currently no consensus concerning molecular pathway(s) critical for the increased inflammation seen in CF. In this study we explore whether the TLR signaling pathway is responsible for the hyperinflammatory response seen in CF. TLRs allow for the recognition of diverse microbial epitopes, inducing a cascade of effector responses within minutes (7). Individual TLRs recognize a distinct, but limited, repertoire of conserved microbial products; for example, well-characterized receptor-ligand pairs include TLR4 and LPS, TLR5 and flagellin, and TLRs1/2/6 and lipoproteins. TLR signaling is a likely contributor to the excess inflammation seen in the CF lung because: 1) functional TLRs are expressed by CF airway epithelial cells and by hemopoietic cells within the lung (8, 9); 2) TLR signaling generates the cytokines known to be up-regulated in the CF lung, particularly IL-8, IL-6, IL-1β, and TNF-α (10, 11); and 3) TLRs are able to respond to ligands expressed by the major CF pathogens, including P. aeruginosa, B. cepacia complex, Staphylococcus aureus, and Haemophilus influenzae (12, 13, 14). To address the gap in our understanding of inflammation in CF, we examined whether TLR signaling is responsible for the excessive inflammation seen in CF and whether inhibiting TLR signaling can reduce this damaging inflammation. Rather than relying exclusively on cellular or animal models of disease, we show that the TLR pathway is dysregulated in fresh blood cells of humans living with CF, making these findings a clinically relevant starting point for characterization of the TLR pathway that may be targeted for treatment of CF lung disease. Studies on the inflammatory response in the CF airway were performed on the well-characterized CF and CF-corrected lung epithelial cells IB3-1 (compound heterozygote for the ΔF508 and W1282X CFTR mutations) and C38 (a “corrected” CF cell line derived from IB3-1 after stable transfection with CFTR) (American Type Culture Collection) (15). Cells were grown in precoated flasks (100 μg/ml BSA, 30 μg/ml bovine collagen I, 10 μg/ml human fibronectin) in LHC-8 basal medium (Invitrogen) supplemented with 10% (v/v) FCS, 2 mM l-glutamine, 1 mM sodium pyruvate, and 1% penicillin-streptomycin-amphotericin B solution at 37°C and 5% CO2. The C38 and IB3-1 cell lines were seeded into precoated 96-well plates at a density of 5 × 104 cells per well 16 h before use in stimulation assays. To assess cell viability after the 48 h stimulation with bacteria or TLR-ligands, release of a cytoplasmic enzyme (lactate dehydrogenase) into the supernatant by damaged cells was measured using a cell cytotoxicity kit (Roche). Blood samples from CF patients were obtained at BC Children’s Hospital and St. Paul’s Hospital, Vancouver, Canada. The diagnosis of CF was established by typical clinical features, which included increased sweat chloride concentrations (>60 mmol/L) and detection of CF-inducing mutations. All patients with CF were clinically stable at the time of blood donation, and we excluded any subjects who were receiving systemic immunosuppressive medications, such as oral corticosteroids and azithromycin (due to potential immunomodulatory activity). All samples were obtained with informed consent. Control samples were obtained from children undergoing elective surgery for noninfectious, noninflammatory conditions and from healthy adult volunteers. University of British Columbia Clinical Research Ethics Board approved all studies. The technique for isolating PBMCs has been described (16). Bacterial strains used in this study are outlined in Table I⇓. For complementation of the knockout mutant P. aeruginosa PAKΔfliC, the fliC gene was amplified by a tailed PCR using the primers fliCUE (AAAAAGAATTCGCAGGCCGAGAGATCGCAAGCTCAGG) and fliCDB (AAAAAGGATCCCCTCCCAGTACCGCGTGAGTGACCG) together with genomic DNA from P. aeruginosa PAO1 as a template. The PCR product was isolated, hydrolyzed with EcoRI and BamHI, and cloned into the broad-host-range vector pUCP22 (17). In the resulting plasmid, pUCP22:fliC, the fliC gene was arranged colinear to and downstream of the lacZ promoter. The plasmid was transferred to P. aeruginosa PAKΔfliC by electroporation, resulting in strain P. aeruginosa PAKΔfliC (pUCP22:fliC). For the stimulation assays bacteria were harvested at late-log or early stationary phase of growth. To control for motility differences between wild-type and flagellin-mutant strains, bacteria were heat killed before use. Swimming motility was assessed by inoculation into soft Luria-Bertani agar (0.3%) and after 24 h colony diameter was measured with ≤5 mm considered immotile. To assess motility and TLR5 stimulatory capacity of clinical isolates of P. aeruginosa during chronic infection, isolates from 17 patients (10 female, 7 male) were chosen from a library of clinical isolates collected from the CF clinics at BC Children’s Hospital and St. Paul’s Hospital in Vancouver. Four to 12 isolates were chosen per patient, and in total 151 isolates were tested. 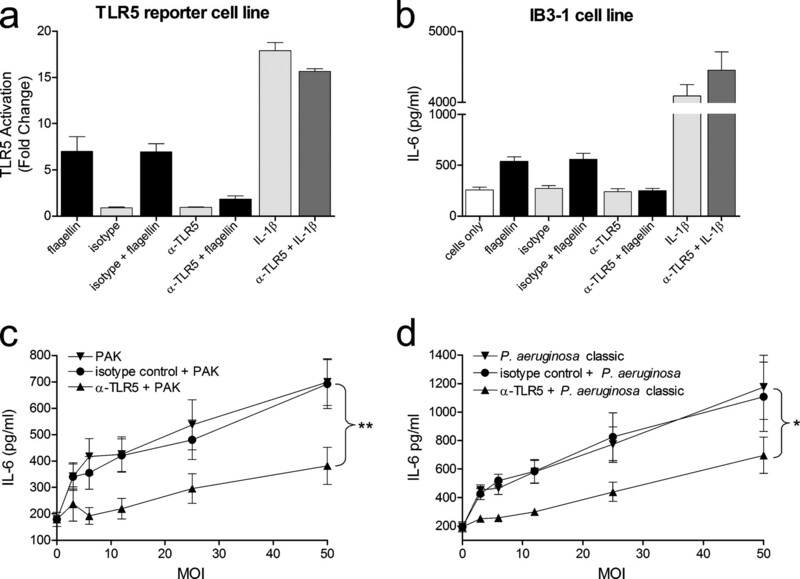 The C38/IB3-1 cell lines and fresh PBMCs were challenged with pure TLR ligands or heat-killed whole bacteria at a variety of multiplicities of infection (MOIs). Optimal concentrations of TLR ligands were determined in pilot experiments (Table II⇓). After 24 h (PBMCs) or 48 h (C38/IB3-1) culture supernatants were harvested and cytokine concentration in the supernatant was measured. In some experiments TLR5 activation was inhibited using a neutralizing polyclonal Ab raised against the extracellular region of human TLR5 (PAb-hTLR5, 6 μg/ml, InvivoGen) with a purified rat IgG1 (eBioscience) serving as a control. Cellular composition of CF and control PBMCs was assessed by flow cytometry. Cells were stained with anti-CD3-PE, anti-CD19-FITC, anti-CD16-FITC, and anti-CD14-FITC Abs, as well as isotype controls, after blocking with 10% human serum (BD Biosciences). Cells were acquired on a FACSCalibur (BD Biosciences) and were analyzed using FlowJo software (Tree Star). The TLR5 reporter cell line has been described (18). CHO K1 cells were stably transfected with human TLR5 cDNA (cloned into the pEF6 V5/His TOPO vector (Invitrogen)) and ELAM-LUC (Promega) plasmids. Cells were stimulated for 3–4 h with heat-killed whole bacteria, TLR ligands, and controls before assaying for luciferase activity (Promega). For studies assessing the TLR5 stimulatory capacity of clinical isolates, a fold change above 4.5 was considered positive based on control studies using wild-type and flagella-deficient strains of P. aeruginosa. Total RNA isolated from airway epithelial cells (RNeasy Plus Mini Kit, Qiagen) was transcribed to cDNA with oligo(dT) primers (high-capacity cDNA reverse transcription kit, Applied Biosystems). Quantitative PCR primers were designed for SYBR Green chemistry to amplify β-actin (5′-GTTGCGTTACACCCTTTCTT-3′, 5′-ACCTTCACCGTTCCAGTTT-3′, 148 bp), TLR5 (5′-TGTTGCAACTTGCCTGGGAAAC-3′, 5′-AACTGTCAGCCTGTTGGAGTTGAG-3′, 170 bp), and Ipaf (5′-TGCCCAGAAATCGAAGCCCTGATA-3′, 5′-TTGGAGCAACAAGCCTTCAGCAAG-3′, 201 bp). Relative gene expression in the CF (IB3-1) compared with CF-corrected (C38) airway cells was analyzed by the 2−ΔΔCt method using β-actin as a reference housekeeping gene. Bacterial whole-cell lysates were assessed for flagellin expression by Western blot using a previously described techniques (19). Groups were compared using unpaired Student’s t tests, two-way ANOVA with Bonferroni posttest for multiple comparisons, or by regression analysis, as appropriate, using GraphPad Prism (version 4.0). A p value <0.05 was considered significant. Initial studies on the inflammatory response in the CF airway were performed on the well-characterized CF and CF-corrected lung epithelial cells IB3-1 and C38. 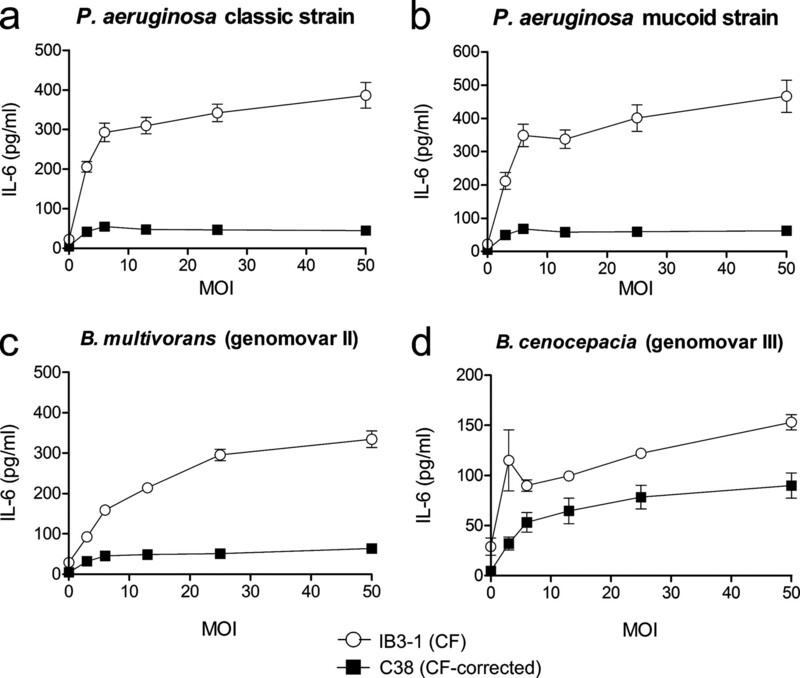 The cell lines were stimulated with: 1) two clinical isolates of P. aeruginosa strain (classic and mucoid); and 2) two clinical isolates of the B. cepacia complex: B. multivorans (genomovar II) and B. cenocepacia (genomovar III). CF respiratory epithelial cells produced 2- to 8-fold more of the proinflammatory cytokine IL-6 than did the CF-corrected cell line when stimulated with whole bacteria (p < 0.001 for all pathogens tested determined by two-way ANOVA with Bonferroni posttest) (Fig. 1⇓). Additionally, the CF cell line produced more proinflammatory IL-6 than did the CF-corrected cells following exposure to Streptococcus pneumoniae (serotypes 4 and 14), a pathogen not typically associated with CF lung disease (data not shown). Cell cytotoxicity assays demonstrated that the viability of the respiratory epithelial cells following bacterial stimulation was equivalent between CF and CF-corrected cells (data not shown). In pilot experiments we demonstrated that production of a variety of inflammatory cytokines (specifically IL-1β, TNF-α, and IL-8) were well correlated with IL-6 secretion following innate immune activation of airway epithelial cells; hence, for most experiments only IL-6 production is shown. Vigorous proinflammatory response generated by CF respiratory epithelial cells following exposure to CF pathogens. a–d, CF-corrected (C38) and CF (IB3-1) airway epithelial cells were stimulated with a range of heat-killed whole bacteria at varying MOIs. IL-6 concentration in cell supernatants after 48 h stimulation was determined by ELISA. 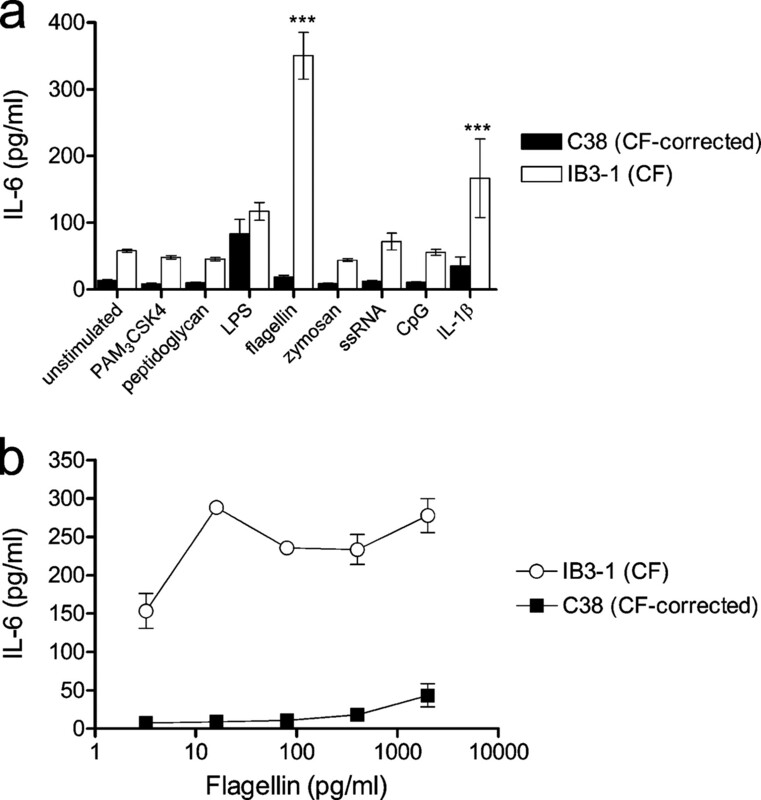 In all cases, the CF (IB3-1) cell line produced significantly more IL-6 than did the CF-corrected (C38) airway cells for all CF pathogens tested (p < 0.001 for all pathogens tested). Values represent means ± SEM of three experiments performed in triplicate. Subtle technical artifacts, possibly related to immortalization and long-term culture, may alter the proinflammatory phenotype of any cell line (6). To address this concern and to validate any findings in CF respiratory epithelial cells, we performed similar experiments using blood cells donated by patients with CF. We elected to study freshly isolated PBMCs to investigate the immune response in CF. Fresh PBMCs have several advantages over other possible human CF samples: 1) PBMCs are not subject to alterations that may emerge from long-term cell culture, cloning, and immortalization; 2) cells within the PBMC population, particularly lymphocytes and some monocytes/macrophages, express functional CFTR protein (20, 21); and 3) the need to study enough subjects makes it impractical to collect cells through other means, such as bronchoalveolar lavage or biopsy. Showing a phenotype similar to CF airway epithelial cells, CF PBMCs produced significantly more proinflammatory IL-6 after stimulation with P. aeruginosa (PAK strain) than did cells from healthy controls at every MOI tested (Fig. 2⇓a; p = 0.0003). Control experiments showed that differences in cytokine production were not simply related to differences in proportions of monocytes, T cells, B cells, and NK cells in the PBMCs isolated from CF patients and healthy controls (Fig. 2⇓b). Hence, both CF airway epithelial cells and blood mononuclear cells generate an exaggerated proinflammatory response following exposure to bacterial pathogens. 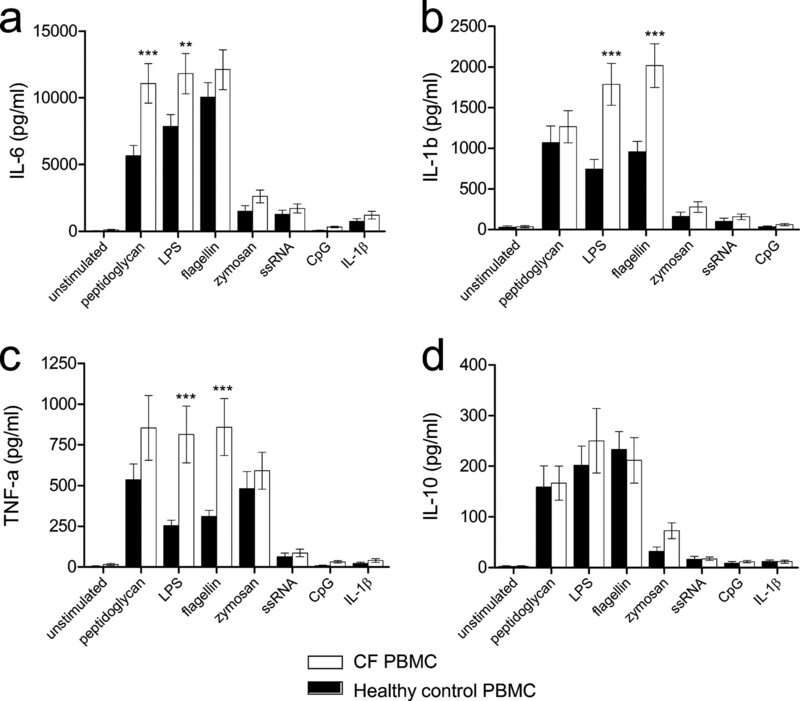 Elevated proinflammatory cytokine production by CF PBMCs following exposure to P. aeruginosa. a, PBMCs from patients with CF (n = 5) and healthy age-matched controls (n = 4) were exposed, in triplicate, to heat-killed P. aeruginosa (PAK strain) at varying MOIs. After 24 h, IL-6 concentration in the supernatant was measured. CF patients produced higher amounts of proinflammatory IL-6. Values represent means ± SEM. Statistical testing was performed by regression analysis demonstrating that slopes of the lines were identical, but the intercepts were significantly different (p = 0.0003), indicating that CF PBMCs produce more IL-6 than did control PBMCs at baseline and following stimulation with PAK strain bacteria. b, Composition of the PBMC population of CF (n = 6) and healthy control (n = 6) subjects was determined by flow cytometry after staining for monocytes, T cells, B cells, and NK cells using mAbs against CD14, CD3, CD19, and CD16, respectively. Values represent means ± SEM. A range of receptor families are involved in innate immune recognition of microbes. These receptor systems include TLRs, the NOD-like proteins, and TNF-α receptor 1 (22). To assess specifically the contribution of TLR signaling to the enhanced inflammatory response generated by CF airway cells following exposure to whole bacteria, we stimulated the respiratory epithelial cells with purified TLR ligands and measured IL-6 production (Fig. 3⇓). Concentrations of TLR ligands resulting in optimal IL-6 production were selected in pilot experiments (Table II⇑). IL-6 production following stimulation with both flagellin and IL-1β was significantly higher in CF respiratory epithelial cells compared with the CF-corrected cell line, while signaling through other TLRs (including the LPS-specific TLR4) was minimal in airway cells. Collectively, these data suggest that TLR signaling is dysregulated in the CF airway cells and that flagellin is a particularly potent stimulator of the airway innate immune response. CF respiratory epithelial cells respond most vigorously to flagellin stimulation. a, CF-corrected (C38) and CF (IB3-1) cell lines were stimulated with a range of pure TLR ligands at concentrations selected by titration to optimize IL-6 production (see Table II for details). b, CF respiratory epithelial cells responded most vigorously to flagellin stimulation. Values represent means ± SEM of two to three experiments performed in triplicate. Statistical analysis was performed by two-way ANOVA using the Bonferroni correction for multiple comparisons. ∗∗∗, p < 0.001. 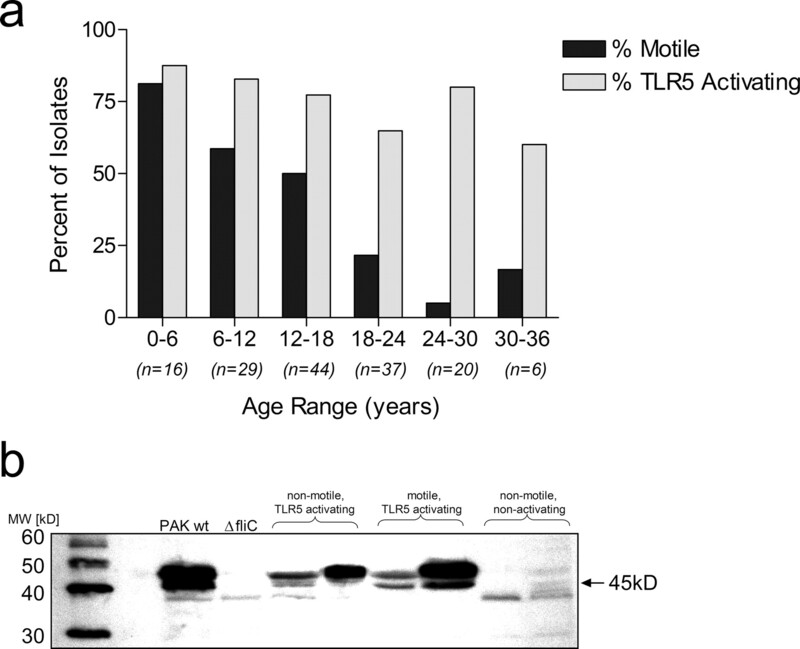 To further explore the hypothesis that TLR signaling contributes to dysregulated cytokine production occurring in CF and to verify our cell line data, we studied TLR function in primary PBMCs donated by 23 children with CF and 20 healthy age-matched controls. As cells within the PBMC population are known to recognize a broader repertoire of TLR ligands than do airway epithelial cells (8, 23), the PBMCs were predicted to produce proinflammatory cytokines in response to a wider variety of TLR ligands than the airway epithelial cells. Hence, the aim of these experiments was to assess whether global TLR responsiveness was dysregulated in primary cells from CF patients. Freshly isolated PBMCs were exposed to an optimized panel of TLR ligands and controls for 24 h, and cytokine production was measured (Fig. 4⇓). The general observation from this data series was that for every condition studied, children with CF produced more proinflammatory cytokine (i.e., IL-6, TNF-α, and IL-1β) following TLR stimulation than did healthy age-matched controls, and these differences reached statistical significance for a number of conditions tested. In contrast, production of the antiinflammatory cytokine IL-10 was indistinguishable between cases and controls. Taken together, these data confirm our findings from immortalized respiratory epithelial cells and suggest that TLR signaling contributes to dysregulated cytokine production seen in CF. Elevated TLR-mediated proinflammatory cytokine production by peripheral blood cells donated by CF patients compared with healthy age-matched controls. a–d, Freshly isolated PBMCs from patients with CF (n = 23) and healthy age-matched controls (n = 20) were stimulated with a range of TLR ligands (outlined in Table II), and cytokine production was measured by cytometric bead array. CF PBMCs produced higher amounts of proinflammatory cytokines (i.e., IL-6, TNF-α and IL-1β) but equivalent levels of the antiinflammatory cytokine IL-10. Values represent means ± SEM. Statistical analysis was performed by two-way ANOVA using the Bonferroni correction for multiple comparisons. ∗, p < 0.05; ∗∗, p < 0.01; ∗∗∗, p < 0.001. Because the CF airway epithelial cells responded most vigorously to the flagellin (Fig. 3⇑), we sought to determine the contribution of flagellin to the enhanced inflammatory response generated by CF airway epithelial cells following exposure to P. aeruginosa. Our experimental strategy was to stimulate respiratory epithelial cells with bacteria expressing a full complement of pathogen-associated molecular patterns, but lacking flagella. We characterized the wild-type (PAK and PAO1) and isogenic flagella-deficient strains of P. aeruginosa (PAKΔfliC, PAO1ΔfliC, PAO1ΔflgE, and PAO1ΔfliM), as well as a complemented strain in which the coding region of the fliC gene was replaced (PAKΔfliC (pUCP22:fliC)). The flagella-deficient strains lacked both swimming motility and the capacity to activate TLR5 (Fig. 5⇓, a, b, d, and e). To control for differences in motility between wild-type and flagella-deficient strains, all bacteria were heat-killed before use in stimulation assays. Strikingly, the absence of the flagellin significantly reduced proinflammatory IL-6 production by the CF respiratory epithelial cells following exposure to P. aeruginosa (Fig. 5⇓, c and f). To verify the role of flagellin in the inflammatory response generated by the CF airway cells, we demonstrated that complementation of the flagellin-knockout mutant of P. aeruginosa (PAKΔfliC) with the coding region of the fliC gene (PAKΔfliC (pUCP22:fliC)) normalized the motility, TLR activating capacity, and proinflammatory impact of the flagellin-deficient strain (Fig. 5⇓a–c). Hence, strategies to block flagellin recognition may have the potential to reduce the excessive and damaging proinflammatory response occurring in the CF lung, ultimately improving the outcome for patients with CF. Stimulation with flagella-deficient strains of P. aeruginosa abolishes proinflammatory IL-6 production by CF respiratory epithelial cells. Compared with wild-type bacteria (PAK and PAO1), isogenic flagella-deficient strains of P. aeruginosa (PAKΔfliC, PAO1ΔfliC, PAO1ΔflgE, and PAO1ΔfliM) lack swimming motility (a and d) and fail to activate a TLR5 reporter cell line—CHO-K1 cells stably expressing human TLR5 and an NF-κB luciferase reporter (b and e). Complementation of the flagellin-knockout mutant of P. aeruginosa (PAKΔfliC) with the coding region of the fliC gene (PAKΔfliC (pUCP22:fliC)) normalized both the motility defect and TLR5 activating capacity. CF (IB3-1) airway epithelial cells were stimulated with these characterized bacteria. To control for differences in motility between wild-type and flagella-deficient strains, all bacteria were heat-killed before use. c and f, IL-6 concentration in cell supernatants after 48 h stimulation was determined by ELISA. Values represent means ± SEM of three to six separate experiments all performed in triplicate. Statistical analysis was performed by two-way ANOVA using the Bonferroni correction for multiple comparisons. ∗, p < 0.05; ∗∗, p < 0.01; ∗∗∗, p < 0.001. To identify a novel antiinflammatory target for CF lung disease, we first had to determine which receptor was mediating flagellin recognition by the airway epithelial cells. TLR5 is the best studied physiological receptor for flagellin in vertebrates; however, recent evidence also implicates IL-1-converting enzyme (ICE) protease-activating factor (Ipaf) in the recognition of intracellular flagellin (24). Expression of the genes encoding these two flagellin receptors was quantified in the airway epithelial cells. TLR5 mRNA expression was 5.5-fold higher in the CF (IB3-1) compared with control (C38) airway epithelial cells (p = 0.0002, unpaired Student’s t test). In contrast, the mRNA expression of Ipaf was indistinguishable between CF and control cells (p > 0.05, unpaired Student’s t test) (Fig. 6⇓). 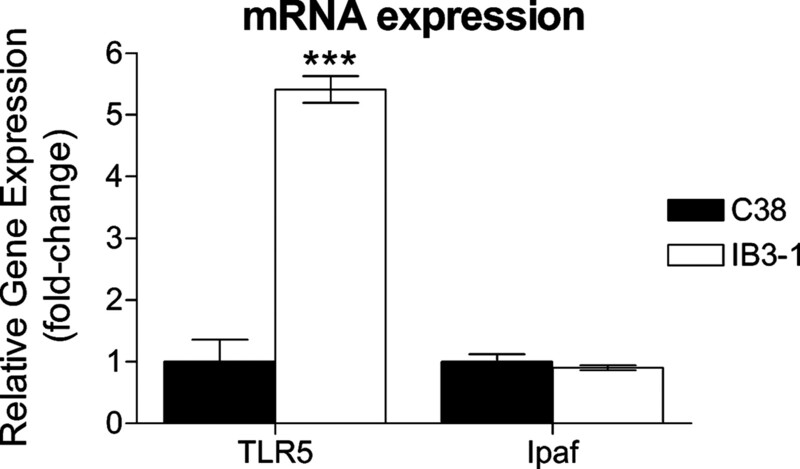 TLR5 mRNA expression is increased in CF airway epithelial cells. TLR5 and Ipaf gene expression in the CF (IB3-1) and CF-corrected (C38) airway cells was determined by quantitative PCR. Relative gene expression was analyzed by the 2−ΔΔCt method using β-actin as a reference gene. Values represent means ± SEM of two separate experiments all performed in triplicate. Statistical analysis was performed by unpaired Student’s t test. ∗∗∗, p < 0.001. Based on our observation that TLR5 mRNA was increased in CF airway epithelial cells, combined with the established physiological role for TLR5 in airway cell biology, we examined whether TLR5 inhibition would reduce the excessive inflammatory response generated by CF airway cells following exposure to CF pathogens. To achieve efficient and specific TLR5 inhibition we used a neutralizing polyclonal Ab raised against the extracellular region of human TLR5. The anti-TLR5 Ab reduced the flagellin response to baseline in both the TLR5 reporter cell line and the CF airway epithelial cells. Importantly, the anti-TLR5 Ab did not alter IL-1β responsiveness, confirming that the inhibition of flagellin recognition was occurring specifically at the level of TLR5 rather than through nonspecific inhibition of a downstream signaling molecule, as the TLR5 and IL-1β signaling pathways differ only in the ligand binding domain of the receptor (Fig. 7⇓, a and b). Specific inhibition of TLR5 abolishes the excessive inflammatory response generated by CF airway epithelial cells following exposure to P. aeruginosa. a and b, A neutralizing polyclonal Ab raised against the extracellular region of human TLR5 (α-TLR5) specifically blocked flagellin responsiveness in both the TLR5 reporter cell line and CF airway epithelial cells (IB3-1). c and d, The anti-TLR5 Ab significantly reduced proinflammatory IL-6 production by CF (IB3-1) airway epithelial cells following exposure to the PAK strain and a classic clinical isolate of P. aeruginosa. Values represent means ± SEM of three experiments performed in duplicate. ∗, p < 0.05; ∗∗, p < 0.01. We assessed the impact of TLR5 inhibition on the CF airway cell inflammatory response generated in response to P. aeruginosa—the most clinically relevant CF pathogen. The anti-TLR5 Ab significantly reduced proinflammatory IL-6 production by CF airway epithelial cells following exposure to the PAK strain (p < 0.01) and a classic clinical isolate (p < 0.01) of P. aeruginosa (Fig. 7⇑, c and d). Importantly, TLR5 inhibition also significantly reduced IL-8 secretion in response to these strains of P. aeruginosa (PAK, p < 0.01; classic clinical isolate, p < 0.01). A potential limitation of therapy to target the TLR5-flagellin interaction in CF is the observation that most environmental P. aeruginosa strains and those isolated early in CF infections are highly motile, whereas some strains isolated from older chronically infected CF patients are immotile. To assess formally both motility and TLR5 stimulatory capacity of P. aeruginosa during chronic infection, we analyzed 151 clinical isolates of P. aeruginosa derived from 17 patients representing 304 patient years of disease. Motility of isolates decreased significantly with increased patient age (p = 0.006 by linear regression). Specifically, 81.2% of isolates from patients aged <6 years were motile compared with only 16.7% motility of isolates from CF patients aged 30–36 years (Fig. 8⇓a). In contrast, the decline in TLR5 activating capacity of P. aeruginosa was less pronounced and did not reach statistical significance, with 87.5% of isolates from patients aged <6 years activating TLR5 compared with 60.0% of isolates from CF patients aged 30–36 years (p = 0.06 by linear regression). Overall, 113 of 151 (75%) clinical isolates of P. aeruginosa activated TLR5. In these experiments we identified 55 isolates (36.4% of total) that were nonmotile but TLR5-activating. To confirm that these nonmotile but TLR5-activating isolates of P. aeruginosa did express immunogenic flagellin, we performed Western blotting on whole protein extracts of the bacteria using a polyclonal Ab against the type a (45-kDa) flagellin of P. aeruginosa P1. Western blot analysis confirmed that 51 of 55 (93%) nonmotile but TLR5-activating isolates of P. aeruginosa stained strongly for immunoreactive flagellin (Fig. 8⇓b). Clinical isolates of P. aeruginosa maintain TLR5 stimulatory capacity during the evolution of chronic CF lung infection. a, The motility and TLR5 stimulatory capacity of 151 clinical isolates of P. aeruginosa were analyzed. Motility of isolates decreased significantly with increasing patient age (p = 0.006 by linear regression) while the decline in TLR5 activating capacity was not significant (p = 0.06 by linear regression). b, Western blot of whole bacteria protein extracts using a polyclonal Ab against the type a (45-kDa) flagellin of P. aeruginosa P1. Figure shows representative clinical isolates of P. aeruginosa characterized for their motility and TLR5 activating capacity with PAK wild-type and PAKΔfliC serving as the positive and negative controls, respectively. Lung damage is the major life-limiting complication of CF. Chronic infection and inflammation are the hallmark of CF lung disease. Novel therapies to target lung inflammation, when administered in combination with airway clearance and antimicrobials, are predicted to improve the lives of people with CF. The challenge has been to identify the molecular pathway(s) mediating the excessive inflammation occurring in the CF airway. We show that TLR-mediated innate immune responsiveness is increased in both CF respiratory epithelial cells and fresh blood cells from subjects living with CF. Moreover, inhibition of the TLR5-flagellin interaction markedly reduced the proinflammatory response of CF respiratory epithelial cells following exposure to the predominant CF pathogen P. aeruginosa. These data suggest that TLR5 activation may represent a novel antiinflammatory target for improving CF lung disease. A potential criticism of many published studies investigating airway inflammation in CF is the reliance on immortalized airway epithelial cells. Aware of this limitation, we used an extensively studied pair of CF and control airway epithelial cells (IB3-1/C38; for examples, see Refs. (25, 26, 27)) and we validated our fundamental observations in primary blood cells donated by CF and control subjects. Bacteria infecting the CF lung must interact with the airway epithelium. Respiratory epithelial cells are an important component of the innate immune system, forming a physical and immunologic barrier to inhaled bacteria. Surprisingly, although P. aeruginosa expresses ligands to activate a variety of TLRs (specifically TLRs 1, 2, 4, 5, 6, and 9 (12, 13, 14, 28)), we have demonstrated that airway epithelial cells almost exclusively rely upon TLR5 to sense P. aeruginosa through its flagellin protein (Figs. 5⇑ and 7⇑). In the absence of TLR5 activation, the interaction of P. aeruginosa with respiratory epithelial cells does not initiate a significant host inflammatory reaction. LPS was initially predicted to be the major immunostimulatory component expressed by P. aeruginosa; however, evidence suggests that the TLR4-mediated response to LPS is minimal in airway cells due to a lack of the necessary coreceptors, including MD2 and CD14 (29, 30, 31). Moreover, the observation that TLR4 knockout mice show no enhanced susceptibility to P. aeruginosa lung infection provides further evidence that the TLR4-LPS interaction is unlikely to account for the florid airway inflammation observed in CF (32, 33). Collectively, our data suggest that a TLR5 inhibitor is likely to minimize the inflammatory response generated by airway epithelial cells following infection with clinically relevant flagellated bacteria such as P. aeruginosa and members of the B. cepacia complex. In contrast, TLR5 is unlikely to be involved in the recognition of nonmotile pathogens such as S. aureus and H. influenzae; however, the role of these organisms in progressive airway infection and inflammation in patients with CF remains uncertain (34). An important recent discovery is that mammalian cells rely on (at least) two molecular systems to sense flagellated bacterial pathogens (24). Extracellular flagellin is recognized by TLR5, activating NF-κB and leading to the secretion of a variety of cytokines, including IL-6 and TNF-α. Intracellular flagellin is detected by Ipaf, initiating IL-1β processing and the secretion of mature IL-1β. In this study we were the first to investigate the relative roles of TLR5 and Ipaf in CF lung infection, demonstrating that TLR5 plays a critical role in recognizing flagellated bacteria, including P. aeruginosa. Our observation that CF airway epithelial cells rely heavily upon TLR5 to sense bacterial pathogens is consistent with the established clinical observation that in the CF lung extracellular bacterial infection predominates, and the respiratory epithelium remains intact despite accumulation of neutrophils, mucin, and bacteria in the airway (35). Previous studies have shown that the presence of flagellin expressed by P. aeruginosa (29, 36, 37) triggers an inflammatory response by airway epithelial cells, but none of these studies have established definitively the identity of the receptor mediating this inflammatory response. Our study using a neutralizing anti-TLR5 Ab (Fig. 7⇑) and other studies using dominant negative TLR5 constructs (14, 38) establish that TLR5 mediates airway cell recognition of P. aeruginosa and the B. cepacia complex; moreover, we demonstrate that a specific TLR5 inhibitor is able to significantly reduce the hyperinflammatory response generated by CF airway epithelial cells following exposure P. aeruginosa, the most clinically relevant bacterial pathogen infecting the CF lung. The challenge in developing an antiinflammatory medication for CF lies in reducing harmful inflammation without unacceptably increasing infections or other untoward effects. A number of observations indicate that TLR5 is a particularly exciting therapeutic target for blocking airway inflammation in CF. First, TLR5 inhibition only blocks the response to flagellin, leaving all other innate immune response mechanisms intact. Second, humans with defective TLR5 signaling have been identified, providing unique insights into the biological effects of interfering with TLR5 function. Approximately 10% of Caucasians carry a polymorphism in the ligand-binding domain of TLR5 (392STOP) that acts in a dominant fashion to abolish flagellin signaling (39). Individuals carrying the TLR5 392STOP polymorphism appear to be entirely healthy, although they are at slightly increased risk of developing Legionnaires disease following exposure to Legionella pneumophila (39). Importantly, this TLR5 polymorphism does not render human carriers universally susceptible to infection with flagellated bacteria, as it had no measurable impact on susceptibility to typhoid fever caused by Salmonella enterica serovar Typhi (40). Finally, mouse studies provide further support for the potential safety of TLR5 inhibition as TLR5−/− and wild-type mice show similar rates of survival following P. aeruginosa lung infection (33), and infection with flagellin-deficient strains of P. aeruginosa delays the time to death (41). Taken together, these data suggest that a specific TLR5 inhibitor may be useful for reducing the excess inflammation in CF while having an acceptable side-effect profile. Despite these reassuring theoretical arguments, we must use caution and humility when interfering with the finely tuned immune system. All consequences of our manipulations are impossible to predict and will be appreciated only through rigorous preclinical experimentation and well-conducted clinical trials. The potential therapeutic value of a TLR5 inhibitor is further supported by our demonstration that 75% (113 of 151) of clinical isolates of P. aeruginosa obtained from the lungs of CF patients retained the capacity to activate TLR5 (Fig. 8⇑). The library of P. aeruginosa isolates tested in this study is likely to be representative of CF patients treated in a large North American center as we analyzed 151 clinical isolates of P. aeruginosa derived from 17 patients representing >300 patient years of disease. The significant loss of motility of P. aeruginosa during the evolution of chronic CF lung infection has been observed by others (19, 42); however, our study is the first demonstration that TLR5 activating capacity of P. aeruginosa is relatively retained in the CF lung across the lifespan. Our observation that 34% of the clinical isolates of P. aeruginosa appear to have “paralyzed” flagellum (i.e., TLR5 activating but nonmotile) is not without precedent. This paralyzed flagellum phenotype has been noted in clinical isolates of P. aeruginosa and is seen in PAK-motABCD, which has deletions in both sets of mot genes encoding the flagellar motor proteins, resulting in loss of motility but preservation of flagellin synthesis (19, 43). Other lines of evidence support the centrality of the TLR5-flagellin interaction in mediating the cyclical exacerbations of the inflammatory lung disease typical of CF. For example, sputum neutrophil elastase is now recognized to be a useful clinical biomarker that negatively correlates with lung function in CF (44). Because the neutrophil elastase content of CF sputum is known to transiently repress expression of a number of P. aeruginosa genes including fliC, which encodes flagellin, a model of CF lung inflammation linking TLR5 activation, flagellin expression, and neutrophil elastase concentration is emerging (42, 45, 46). When neutrophil numbers and neutrophil elastase concentrations in the CF lung are low, P. aeruginosa proliferates, assembles a flagellum, and stimulates a robust inflammatory response via TLR5. Neutrophils are then recruited to the airway, and when neutrophil elastase concentrations reach a threshold, flagellin synthesis is suppressed and TLR5-flagellin-mediated inflammation abates. As neutrophil numbers wane, flagellin synthesis resumes, and there is a resurgence of inflammation. Hence, TLR5 inhibition may be useful in breaking this repetitive cycle of airway infection and inflammation that ultimately causes respiratory failure in CF patients. In conclusion, through the use of both respiratory epithelial cells and fresh blood cells donated by patients with CF, we have shown that TLR signaling results in excessive proinflammatory cytokine production by cells with dysfunctional CFTR protein. Moreover, we have identified a single molecule, TLR5, as a novel antiinflammatory target because inhibition of the TLR5-flagellin interaction abolishes the damaging inflammatory response generated by CF airway cells. Although more studies using both primary CF airway cells and animal models are required, the potential utility of TLR5 inhibition is further supported by our demonstration that clinical isolates of P. aeruginosa generally maintain the ability to activate TLR5 even during chronic lung infection when motility is lost. Ultimately, we anticipate that these preclinical studies may be the first step in developing a new therapy for safely reducing airway inflammation and improving CF lung disease. We acknowledge the contribution of all volunteer subjects and their families for providing blood samples. We thank the CF Clinic Staff at BC Children’s Hospital and St. Paul’s Hospital who facilitated sample acquisition. We acknowledge David P. Speert and Russell E. Vance for mentorship and critical review of this manuscript. ↵1 This work was supported by a Career Development Award from the Canadian Child Health Clinician Scientist Program–a Canadian Institutes of Health Research Strategic Training Program, as well as by operating grants from the Canadian Cystic Fibrosis Foundation, the British Columbia Children’s Hospital Foundation, and the British Columbia Lung Association. C.J.B. and J.O. were supported by the Canadian Cystic Fibrosis Foundation. R.E.W.H. received funding from Genome British Columbia and was the recipient of a Canada Research Chair. ↵3 Abbreviations used in this paper: CF, cystic fibrosis; MOI, multiplicity of infection. Ratjen, F., G. Doring. 2003. Cystic fibrosis. Lancet 361: 681-689. Chmiel, J. F., M. W. Konstan. 2007. Inflammation and anti-inflammatory therapies for cystic fibrosis. Clin. Chest Med. 28: 331-346. Auerbach, H. S., M. Williams, J. A. Kirkpatrick, H. R. Colten. 1985. Alternate-day prednisone reduces morbidity and improves pulmonary function in cystic fibrosis. Lancet 2: 686-688. Konstan, M. W., P. J. Byard, C. L. Hoppel, P. B. Davis. 1995. Effect of high-dose ibuprofen in patients with cystic fibrosis. N. Engl. J. Med. 332: 848-854. Ratjen, F.. 2006. What’s new in CF airway inflammation: an update. Paediatr. Respir. Rev. 7: S70-S72. Machen, T. E.. 2006. Innate immune response in CF airway epithelia: hyperinflammatory?. Am. J. Physiol. 291: C218-C230. Muir, A., G. Soong, S. Sokol, B. Reddy, M. I. Gomez, A. Van Heeckeren, A. Prince. 2004. Toll-like receptors in normal and cystic fibrosis airway epithelial cells. Am. J. Respir. Cell Mol. Biol. 30: 777-783. Greene, C. M., T. P. Carroll, S. G. Smith, C. C. Taggart, J. Devaney, S. Griffin, S. J. O'Neill, N. G. McElvaney. 2005. TLR-induced inflammation in cystic fibrosis and non-cystic fibrosis airway epithelial cells. J. Immunol. 174: 1638-1646. Khan, T. Z., J. S. Wagener, T. Bost, J. Martinez, F. J. Accurso, D. W. Riches. 1995. Early pulmonary inflammation in infants with cystic fibrosis. Am. J. Respir. Crit. Care Med. 151: 1075-1082. Noah, T. L., H. R. Black, P. W. Cheng, R. E. Wood, M. W. Leigh. 1997. Nasal and bronchoalveolar lavage fluid cytokines in early cystic fibrosis. J. Infect. Dis. 175: 638-647. Erridge, C., A. Pridmore, A. Eley, J. Stewart, I. R. Poxton. 2004. Lipopolysaccharides of Bacteroides fragilis, Chlamydia trachomatis, and Pseudomonas aeruginosa signal via Toll-like receptor 2. J. Med. Microbiol. 53: 735-740. Epelman, S., D. Stack, C. Bell, E. Wong, G. G. Neely, S. Krutzik, K. Miyake, P. Kubes, L. D. Zbytnuik, L. L. Ma, et al 2004. Different domains of Pseudomonas aeruginosa exoenzyme S activate distinct TLRs. J. Immunol. 173: 2031-2040. Adamo, R., S. Sokol, G. Soong, M. I. Gomez, A. Prince. 2004. Pseudomonas aeruginosa flagella activate airway epithelial cells through asialoGM1 and Toll-like receptor 2 as well as Toll-like receptor 5. Am. J. Respir. Cell Mol. Biol. 30: 627-634. Flotte, T. R., S. A. Afione, R. Solow, M. L. Drumm, D. Markakis, W. B. Guggino, P. L. Zeitlin, B. J. Carter. 1993. Expression of the cystic fibrosis transmembrane conductance regulator from a novel adeno-associated virus promoter. J. Biol. Chem. 268: 3781-3790. Hirschfeld, A. F., J. A. Bettinger, R. E. Victor, D. J. Davidson, A. J. Currie, J. M. Ansermino, D. W. Scheifele, J. S. Orange, S. E. Turvey. 2007. Prevalence of Toll-like receptor signalling defects in apparently healthy children who developed invasive pneumococcal infection. Clin. Immunol. 122: 271-278. West, S. E., H. P. Schweizer, C. Dall, A. K. Sample, L. J. Runyen-Janecky. 1994. Construction of improved Escherichia-Pseudomonas shuttle vectors derived from pUC18/19 and sequence of the region required for their replication in Pseudomonas aeruginosa. Gene 148: 81-86. Smith, K. D., E. Andersen-Nissen, F. Hayashi, K. Strobe, M. A. Bergman, S. L. Barrett, B. T. Cookson, A. Aderem. 2003. Toll-like receptor 5 recognizes a conserved site on flagellin required for protofilament formation and bacterial motility. Nat. Immunol. 4: 1247-1253. Mahenthiralingam, E., M. E. Campbell, D. P. Speert. 1994. Nonmotility and phagocytic resistance of Pseudomonas aeruginosa isolates from chronically colonized patients with cystic fibrosis. Infect. Immun. 62: 596-605. Chen, J. H., H. Schulman, P. Gardner. 1989. A cAMP-regulated chloride channel in lymphocytes that is affected in cystic fibrosis. Science 243: 657-660. Di, A., M. E. Brown, L. V. Deriy, C. Li, F. L. Szeto, Y. Chen, P. Huang, J. Tong, A. P. Naren, V. Bindokas, et al 2006. CFTR regulates phagosome acidification in macrophages and alters bactericidal activity. Nat. Cell. Biol. 8: 933-944. Gomez, M. I., A. Lee, B. Reddy, A. Muir, G. Soong, A. Pitt, A. Cheung, A. Prince. 2004. Staphylococcus aureus protein A induces airway epithelial inflammatory responses by activating TNFR1. Nat. Med. 10: 842-848. Hornung, V., S. Rothenfusser, S. Britsch, A. Krug, B. Jahrsdorfer, T. Giese, S. Endres, G. Hartmann. 2002. Quantitative expression of Toll-like receptor 1–10 mRNA in cellular subsets of human peripheral blood mononuclear cells and sensitivity to CpG oligodeoxynucleotides. J. Immunol. 168: 4531-4537. Miao, E. A., E. Andersen-Nissen, S. E. Warren, A. Aderem. 2007. TLR5 and Ipaf: dual sensors of bacterial flagellin in the innate immune system. Semin. Immunopathol. 29: 275-288. Vij, N., M. O. Amoako, S. Mazur, P. L. Zeitlin. 2008. CHOP transcription factor mediates IL-8 signaling in cystic fibrosis bronchial epithelial cells. Am. J. Respir. Cell Mol. Biol. 38: 176-184. Borgatti, M., V. Bezzerri, I. Mancini, E. Nicolis, M. C. Dechecchi, I. Lampronti, P. Rizzotti, G. Cabrini, R. Gambari. 2007. Induction of IL-6 gene expression in a CF bronchial epithelial cell line by Pseudomonas aeruginosa is dependent on transcription factors belonging to the Sp1 superfamily. Biochem. Biophys. Res. Commun. 357: 977-983. Muselet-Charlier, C., T. Roque, E. Boncoeur, K. Chadelat, A. Clement, J. Jacquot, O. Tabary. 2007. Enhanced IL-1β-induced IL-8 production in cystic fibrosis lung epithelial cells is dependent of both mitogen-activated protein kinases and NF-κB signaling. Biochem. Biophys. Res. Commun. 357: 402-407. Power, M. R., Y. Peng, E. Maydanski, J. S. Marshall, T. J. Lin. 2004. The development of early host response to Pseudomonas aeruginosa lung infection is critically dependent on myeloid differentiation factor 88 in mice. J. Biol. Chem. 279: 49315-49322. Tseng, J., J. Do, J. H. Widdicombe, T. E. Machen. 2006. Innate immune responses of human tracheal epithelium to Pseudomonas aeruginosa flagellin, TNF-α, and IL-1β. Am. J. Physiol. 290: C678-C690. Jia, H. P., J. N. Kline, A. Penisten, M. A. Apicella, T. L. Gioannini, J. Weiss, P. B. McCray, Jr. 2004. 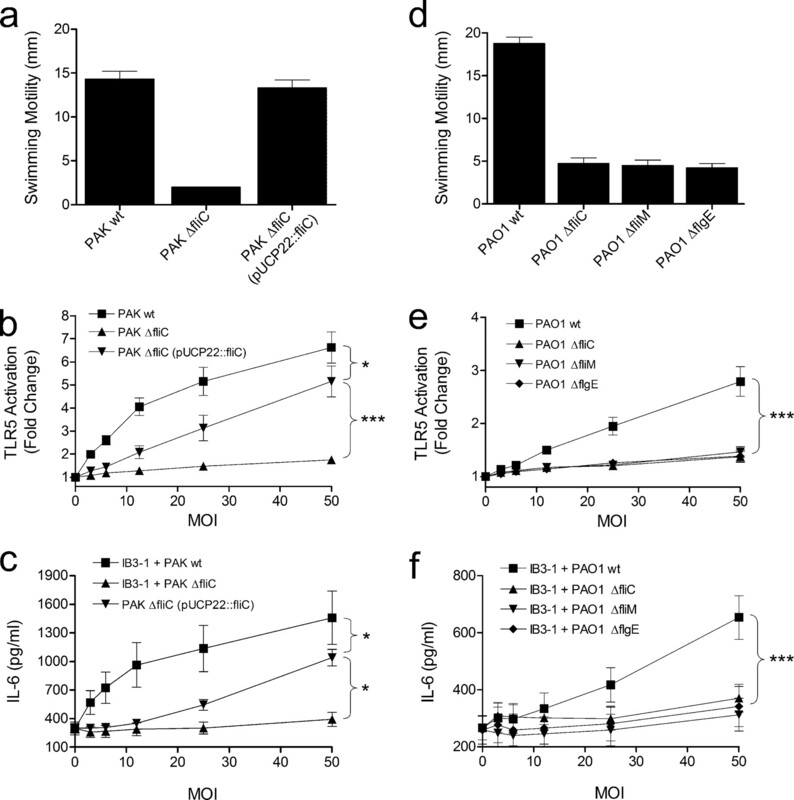 Endotoxin responsiveness of human airway epithelia is limited by low expression of MD-2. Am. J. Physiol. 287: L428-L437. Becker, M. N., G. Diamond, M. W. Verghese, S. H. Randell. 2000. CD14-dependent lipopolysaccharide-induced β-defensin-2 expression in human tracheobronchial epithelium. J. Biol. Chem. 275: 29731-29736. Ramphal, R., V. Balloy, M. Huerre, M. Si-Tahar, M. Chignard. 2005. TLRs 2 and 4 are not involved in hypersusceptibility to acute Pseudomonas aeruginosa lung infections. J. Immunol. 175: 3927-3934. Feuillet, V., S. Medjane, I. Mondor, O. Demaria, P. P. Pagni, J. E. Galan, R. A. Flavell, L. Alexopoulou. 2006. Involvement of Toll-like receptor 5 in the recognition of flagellated bacteria. Proc. Natl. Acad. Sci. USA 103: 12487-12492. Goss, C. H., J. L. Burns. 2007. Exacerbations in cystic fibrosis. 1: Epidemiology and pathogenesis. Thorax 62: 360-367. Sadikot, R. T., T. S. Blackwell, J. W. Christman, A. S. Prince. 2005. Pathogen-host interactions in Pseudomonas aeruginosa pneumonia. Am. J. Respir. Crit. Care Med. 171: 1209-1223. Hybiske, K., J. K. Ichikawa, V. Huang, S. J. Lory, T. E. Machen. 2004. Cystic fibrosis airway epithelial cell polarity and bacterial flagellin determine host response to Pseudomonas aeruginosa. Cell. Microbiol. 6: 49-63. Skerrett, S. J., C. B. Wilson, H. D. Liggitt, A. M. Hajjar. 2007. Redundant Toll-like receptor signaling in the pulmonary host response to Pseudomonas aeruginosa. Am. J. Physiol. 292: L312-L322. Zhang, Z., J. P. Louboutin, D. J. Weiner, J. B. Goldberg, J. M. Wilson. 2005. Human airway epithelial cells sense Pseudomonas aeruginosa infection via recognition of flagellin by Toll-like receptor 5. Infect. Immun. 73: 7151-7160. Hawn, T. R., A. Verbon, K. D. Lettinga, L. P. Zhao, S. S. Li, R. J. Laws, S. J. Skerrett, B. Beutler, L. Schroeder, A. Nachman, et al 2003. A common dominant TLR5 stop codon polymorphism abolishes flagellin signaling and is associated with susceptibility to Legionnaires’ disease. J. Exp. Med. 198: 1563-1572. Dunstan, S. J., T. R. Hawn, N. T. Hue, C. P. Parry, V. A. Ho, H. Vinh, T. S. Diep, D. House, J. Wain, A. Aderem, et al 2005. Host susceptibility and clinical outcomes in Toll-like receptor 5-deficient patients with typhoid fever in Vietnam. J. Infect. Dis. 191: 1068-1071. Balloy, V., A. Verma, S. Kuravi, M. Si-Tahar, M. Chignard, R. Ramphal. 2007. The role of flagellin versus motility in acute lung disease caused by Pseudomonas aeruginosa. J. Infect. Dis. 196: 289-296. Wolfgang, M. C., J. Jyot, A. L. Goodman, R. Ramphal, S. Lory. 2004. Pseudomonas aeruginosa regulates flagellin expression as part of a global response to airway fluid from cystic fibrosis patients. Proc. Natl. Acad. Sci. USA 101: 6664-6668. Arora, S. K., A. N. Neely, B. Blair, S. Lory, R. Ramphal. 2005. Role of motility and flagellin glycosylation in the pathogenesis of Pseudomonas aeruginosa burn wound infections. Infect. Immun. 73: 4395-4398. Mayer-Hamblett, N., M. L. Aitken, F. J. Accurso, R. A. Kronmal, M. W. Konstan, J. L. Burns, S. D. Sagel, B. W. Ramsey. 2007. Association between pulmonary function and sputum biomarkers in cystic fibrosis. Am. J. Respir. Crit. Care Med. 175: 822-828. Sonawane, A., J. Jyot, R. During, R. Ramphal. 2006. Neutrophil elastase, an innate immunity effector molecule, represses flagellin transcription in Pseudomonas aeruginosa. Infect. Immun. 74: 6682-6689. Jyot, J., A. Sonawane, W. Wu, R. Ramphal. 2007. Genetic mechanisms involved in the repression of flagellar assembly by Pseudomonas aeruginosa in human mucus. Mol. Microbiol. 63: 1026-1038. Simpson, D. A., R. Ramphal, S. Lory. 1992. Genetic analysis of Pseudomonas aeruginosa adherence: distinct genetic loci control attachment to epithelial cells and mucins. Infect. Immun. 60: 3771-3779. Hancock, R. E., A. M. Carey. 1979. Outer membrane of Pseudomonas aeruginosa: heat- 2-mercaptoethanol-modifiable proteins. J. Bacteriol. 140: 902-910. Kropinski, A. M., L. C. Chan, F. H. Milazzo. 1979. The extraction and analysis of lipopolysaccharides from Pseudomonas aeruginosa strain PAO, and three rough mutants. Can. J. Microbiol. 25: 390-398. Jarrell, K. F., A. M. Kropinski. 1981. Isolation and characterization of a bacteriophage specific for the lipopolysaccharide of rough derivatives of Pseudomonas aeruginosa strain PAO. J. Virol. 38: 529-538. Lewenza, S., R. K. Falsafi, G. Winsor, W. J. Gooderham, J. B. McPhee, F. S. Brinkman, R. E. Hancock. 2005. Construction of a mini-Tn5-luxCDABE mutant library in Pseudomonas aeruginosa PAO1: a tool for identifying differentially regulated genes. Genome Res. 15: 583-589.